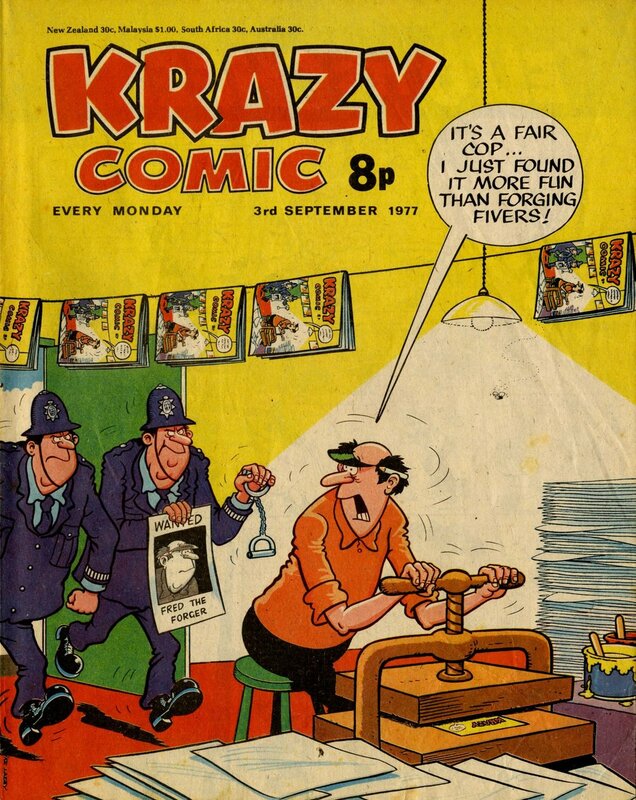 I get the impression that Mike Lacey was considered by the editorial staff at IPC HQ to own a pair of the safest of hands, as so many front cover art duties on the humour comics list were entrusted to him. Mike was responsible for the Shiver and Shake covers during most of that title's first year. For about a decade and a half, he was the artist on Sid's Snake on page one of Whizzer and Chips (and concurrently on Shiner, on the front of the inner Chips supplement). He produced almost all of the brilliantly inventive Krazy front covers. As creator of Bumpkin Billionaires he drew the cover lead on Whoopee! for a few years in the late 1970s, as creator of Shipwreck School he held the same honour for Wow! in the early 1980s, and he contributed a fair number of covers for Jackpot too. I haven't counted, but I wouldn't be surprised to learn that Mike drew more front covers than any other IPC artist. He's a great talent. Wow!, Sid's Snake, Shiner, Classic cover artists, Bumpkin Billionaires, Shiver and Shake, Shipwreck School, Krazy, Whizzer and Chips, Whoopee!